I've written before about fairytales I do not like. They are legion. One I do like, however, is The Golden Ball or The Frog Prince. It's about a princess who throws her golden ball into the well, which is then rescued by a frog. His condition? That she take him into the castle with her and carry him everywhere. She says yes yes, gets the ball and then runs inside. At dinner that night the frog knocks on the castle door to remind her of her promise, and the king enforces it. Lesson - do not make promises you don't intend to keep. Later of course, he turns into a Prince. I haven't seen the Disney version yet, but I'm looking forward to it. Anyway, yesterday, we went to the beach with a golden ball. It even had sparkles in it. This was, as I now know, foolish. The tide was in and there wasn't a lot of sand. The first thing my Sprocket did was throw the ball into the water. "Call Fireman Sam!" he told us. Fireman Sam is a cartoon character and if he were alive he'd live in PondyPandy in Wales, UK. "I don't have his phone number," I told the Sprocket. Gritting my teeth, I took off shoes and socks, rolled up my cords and paddled into the icy water. Did I mention it was -1celsius yesterday? A beautiful blue sky, completely cloudless, but -1. Gritting my teeth I headed off after the ball, which was bobbing happily along the coast. Returning with the ball (and sopping trousers) I handed it to my Firstborn. "Now Sprocket, Fireman Sam does not live around here. Do not throw the ball into the water. Mummy does not want to go into the water again. Okay?" He nodded. "Okay." I handed the ball back to him. He threw it into the water. He has an exceptionally good throwing arm. "Call Fireman Sam!" he said happily. "I told you, Sprocket! We don't have his number! Fireman Sam is not going to get here." "In you go, Fireman Mummy," My Beloved said cheerfully. He still had his shoes and socks on. Again I entered the icy water and retrieved the golden ball. "Okay, Sprocket. Mummy is not going to retrieve that ball again. You throw it into the sea and its gone. And neither Fireman Sam nor Mummy is going to get it back!" I threw the ball to him. He threw it back. We repeated this a few times. And then he ran off and threw it into the sea again. He ran back and pointed to the ball as it floated into the yonder. "Look! Call Fireman Sam!" "Okay. All gone. Lost," I explained. "We don't have Fireman Sam's number," I said. "And I told you, I'm not going in again. You can negotiate with your Daddy. But as far as I'm concerned, it's gone." We watched it drifting away, sparkling in the sun. It was following the line of the bay along the coast. I got to thinking about poor sea creatures, a whale or something, swallowing it up, thinking it was a jellyfish. It was plastic. Rubbish. Killing material. Damn it. We'd better retrieve it. "See that ramp," I pointed out to my beloved, "We'll try to pick it up there." He herded the kids and they ran along to the ramp while I gathered up shoes and socks. At the ramp, the ball bobbed just out of reach. I scurried along the rocks until the ball was just in reach. Victory. We had the ball back. I handed it to my son. He was firmly told not to throw it into the water. So I probably shouldn't have been surprised when, not long after that, he kicked it over the edge of the ramp... We ran up to the path and along to the next platform and then down the scrub path. 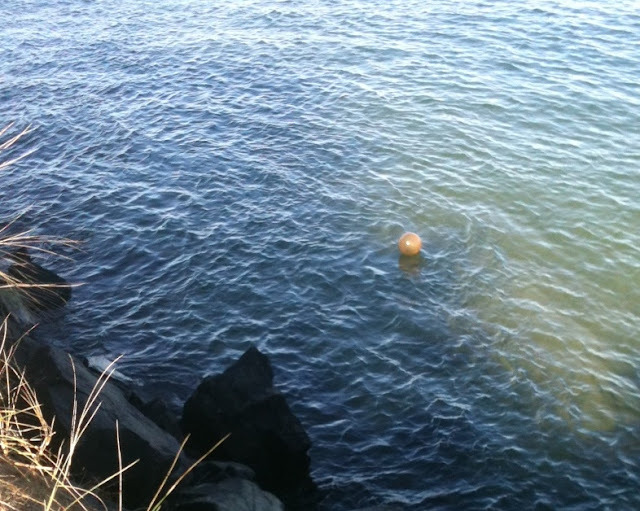 The ball was just in reach, bobbing along the line of rocks put there to prevent erosion. Scrambling down I balanced along the rocks until the ball was just close enough to lean out precariously and gather up. Triumphantly, I returned with the spoils. My Sprocket held out his arms. "No. Mummy's ball. Mummy is holding the ball until we're home." His face crumbled. He tried big eyes, sad eyes, grumpy disbelieving eyes and humorous, you-can't-be-serious-ha-ha-Mummy-what-a-joke-eyes. I stayed firm. We headed inland along the paths through the bush thicket back to the playground. Here, far from water, we played catch. I'm still waiting for the reward for my rescue. Do I get a princess? A frog? A frog-prince? Will I kiss my beloved and he will turn into one of those cute little green tree frogs? Or will that be my Sprocket who transforms? Hmmm. Let me go try it out. but if it had been me I would have kept the ball after the 2nd deliberate throw in the water, and pointed out he was being unkind. I did let the ball float away after the 2nd time... but then I got the guilts about all the sea creatures. I think he's still in shock about Fireman Sam's non-appearance to rescue the ball!